New month, new beginnings! I have finally gotten off our IKEA chairs (no couch yet, ha) and gone for a run, my first since some time in July or early August. Hmmm. It was the perfect running weather this morning, and I discovered a good route that manages to avoid heavy traffic. Could this be meant-to-be? I’m obviously not going to be doing the Cardiff Half Marathon in a couple of weeks like I had originally planned, so now I’m looking at a January race to keep me motivated. Stay tuned on how long this running phase lasts! With running, there will be healthier eating around here! I’ve recently been on a hummus-perfecting-roll. 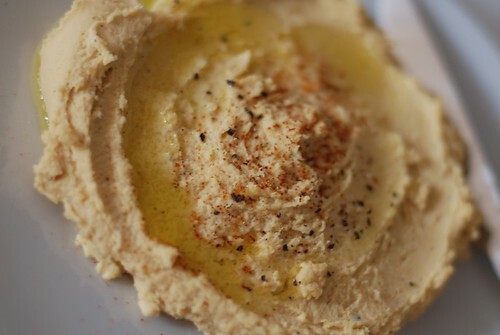 Hummus is really easy to make, although it can require a bit of planning ahead. The ingredient list below looks long and therefore suggests a laborious process; however, once you’ve gathered your ingredients (and they’re all fairly cheap to procure), it’s just a matter of throwing everything together in a blender. The spices make the list look long, but then again, a lot of these spices are staples in my kitchen, so the investment wasn’t too bad. I start with dry chickpeas, but I’ve given the rough quantity you’d need if you were to buy cooked/canned chickpeas, too. See? Simple. As I mentioned in a previous post, I really enjoyed Melissa Clark’s Cook This Now, and I’ve been playing with a lot of her recipes in the kitchen. This is one of those recipes I keep going back to. I’ve been trying to pare down some of the recipe yields in her book, decreasing the quantities until I make just the right sized batch for Alex and me to enjoy. The recipe below makes just enough for us, so I know that it’ll be consumed within a day or two before we get tired of the hummus and push it to the back of the fridge…only to discover a mouldy container months later. If you were entertaining, I’d suggest quadrupling the recipe (but go easy on the garlic – 8 cloves altogether might be a bit too much!). Soak dry chickpeas overnight. Bring a pot of generously salted water, bay leaf, and whole garlic clove to a boil. Add chickpeas, bring back to a boil, and turn down the heat. Cover and let simmer for 45 minutes to an hour, or until the chickpeas are cooked through and soft. Drain the chickpeas, reserving the liquid if you remember to do so. You can use this liquid instead of fresh water for the recipe. Peel each chickpea. Yes, you read that right. You don’t have to, but I do it, and it really does make your hummus that much smoother. Peeling the chickpeas probably takes away some fibre content, so if you’d rather be wholesome-like, go ahead, that’s cool. Whizz the minced garlic clove, juice of 1/4 of a lemon, tahini, water, salt, cayenne, cumin, and pepper together in a small food processor/blender. Add in chickpeas and purée. The mixture might be a bit dry and difficult to move around after a while, and at that point, you can drizzle in the olive oil. Continue to process until everything comes together beautifully. If the hummus in the blender looks too dry, you can add in water 1 tsp at a time, but give it a chance first. The paste always looks a bit thick to start with, but the liquids will be distributed properly and it’ll look OK. Serve with a generous drizzle of good quality olive oil on top, and another pinch of cayenne or smoked paprika if you’ve got it. Goes well with everything, guilt-free.